"They" say that reading is dying. It's certainly true that literature is losing ground to the pervasive influence of television, cinema and the Internet. But every few years, a book manages to distinguish itself and become a cultural phenomenon - the Harry Potter series and The Da Vinci Code were two of the biggest literary hits from the last decade. Lots of people read these books - even people who "don't read." 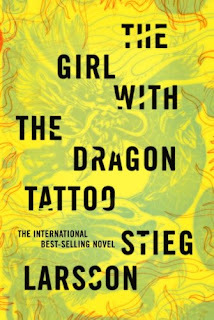 The Girl with the Dragon Tattoo, by the late Swedish journalist Stieg Larsson, appears to be the first major literary hit of the new decade, even if it was written over six years ago. Larsson died in 2004, leaving behind a few unpublished novels that quickly became major bestsellers in Sweden. The English translation of the first book arrived in 2008, with the two subsequent entries in the series hitting the market soon after. All three currently sit atop the list of bestsellers on Amazon.com, and they're making big strides on the various New York Times lists as well. The plot centers around two main characters. Mikael Blomkvist is a journalist who was recently found guilty in a libel suit after trying to take on a notorious Scandinavian business executive. 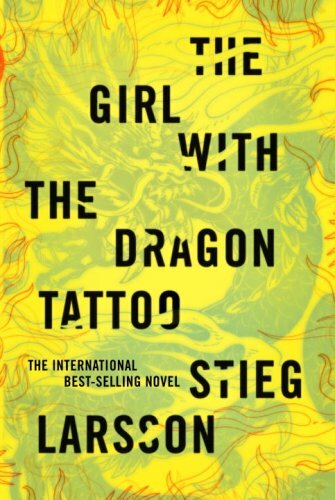 Lisbeth Salander, the eponymous tattooed girl, is a young, socially awkward private investigator who likes to keep an aura of mystery around her. Filling the rest of the supporting cast is the Vanger family - a clan of Swedish billionaires who run one of the country's major companies. Henrik Vanger, the aging patriarch of the family, hires Blomkvist to investigate the mysterious disappearance of his niece - a disappearance that occurred over thirty years ago. As the novel slowly unwinds, it reveals itself as half corporate thriller and half who-dunnit locked room mystery. Like most such books, the first fifty pages or so are weighed down by large chunks of expository dialogue, as Larsson slowly arranges all the pieces on his chessboard. Once the pieces are in place and the game begins, however, the book was difficult to put down, even if in the back of my mind I recognized that certain plot twists were contrived and/or simply ludicrous. The strength of the novel lies in the Vangers, an ambitious, rich family peppered with both likable and despicable characters. As Blomkvist struggles to unravel the mystery and the sins and secrets of the Vangers are put forth, I enjoyed watching Vangers quarrel amongst each other in the same way I enjoy celebrity gossip. It's petty, it's pointless, and it's undeniably fun to read about. Unfortunately, though the book is loaded with a colorful supporting cast, I found the main characters slightly less captivating. The best mystery novels manage to create a detective every bit as interesting as the suspects - unfortunately, Blomkvist is no Sherlock Holmes or Hercule Poirot. Instead, he's a thinly-constructed do-gooder, a character defined by the fact he appears to be the only decent person in a cast of sinners and criminals. In many ways, he reminded me of a Swedish Jack Ryan - a character left as an empty shell so any reader can imagine themselves as the protagonist. Since Blomkvist also seems to demonstrate a James Bond-like capacity for scoring women, one might wonder if Larsson saw a little of himself in Blomkvist, one journalist to another. Salander is slightly more interesting, due to the fact that she at least has some shortcomings - though a computer mastermind and top-notch investigator, her social awkwardness (bordering on a mental problem) leads her to be almost immobile in society. But her taciturn demeanor adds to her appeal - as hard-assed silent heroines go, she's one of the better ones. And her abusive past has left her with a thirst for revenge that is not always conducive to her casework. It's unfortunate that Salander doesn't even come into her own until halfway through the novel - she's the more interesting protagonist by far. (It's worth noting that, though the book is named after her, it's an American invention. The original Swedish title translated to The Men Who Hate Women - a far more appropriate and far less marketable title). As the mysterious disappearance is slowly unraveled, I found myself unable to stop reading the book. The subplot that bookends this mystery, however, centers around Blomkvist's enmity with some Swedish businessman, and is far less interesting. The book might have been able to skim this subplot and lose about fifty pages or so - not only does it fail to hold up to the main mystery, but it too often devolves into the "computers can do anything" trope that has been utilized by authors since the dawn of the digital age. Just because Salander has some skills as a hacker should not render her omnipotent. The book, while great fun, also manages to touch on the periphery of some larger, more important themes. Misogyny and journalistic integrity are at least two of the subjects explored. Larsson manages to work these questions into the plot without ever appearing overly didactic or moralizing. Other such themes left me wishing I knew a little more about modern Sweden - subjects such as the Nazi past of Swedish octogenarians or the Swedish welfare system as it applies to the mentally ill might be important subjects in Larsson's own country, but my ignorance left me clueless as to whatever points he might have been trying to make. But this is a fun thriller novel first and foremost. There are a bunch of cheap tricks, ridiculous plot twists and chapters ending in cliffhangers. But these things, while making it unlikely Larsson's books will ever win the Pulitzer, make them perfect for lazy summer reading while on vacation. As these Lazy Summer Authors go, I'd place Larsson above Dan Brown, and certainly on par with Tom Clancy or Michael Crichton. It's the kind of book you can shred through in an afternoon, captivated by the plot. Take it to the beach, take it on a plane, take it on vacation. It's thoroughly enjoyable and eminently forgettable - which makes it the best kind of summer reading.